Tickets are now on sale for all four shows in September. Tickets on-sale now for Birmingham, Manchester and Edinburgh. We now have the Artist 24 hour Pre-Sale links for Birmingham, Manchester, and Edinburgh as copied below. The links are live from 10am tomorrow, 31st March. 'Man & Myth' Release Day! Available now on CD, MP3, FLAC and Vinyl LP. Find it here at the Roy Harper Shop. "The critically acclaimed British singer-songwriter Roy Harper appears in this exclusive new documentary film. Shot mainly at his home in the Irish countryside near Cork, it traces his intriguing career as he records new material. Man and Myth is Harper's first studio album for 13 years. Examining the work that made him famous, respected and much loved, this film includes special interviews with fellow legendary musicians Jimmy Page, Robert Plant and Johnny Marr." Roy is very pleased to announce that Jonathan Wilson has been added to the bill and will be joining him on stage for three special shows in October. Jonathan will be performing a solo acoustic set to open each show and will accompany Roy throughout the rest of the evening. Having recorded four songs from the new album 'Man And Myth' with him in Los Angeles, Roy is looking forward to the opportunity to showcase these new songs live with Jonathan. This, along with the string and brass arrangements by Fiona Brice, plus a few old favourites, will make for a very special show indeed. Roy will be doing an In-store performance and signing of the new album, 'Man And Myth', at Rough Trade East, London on September 23rd at 7pm. 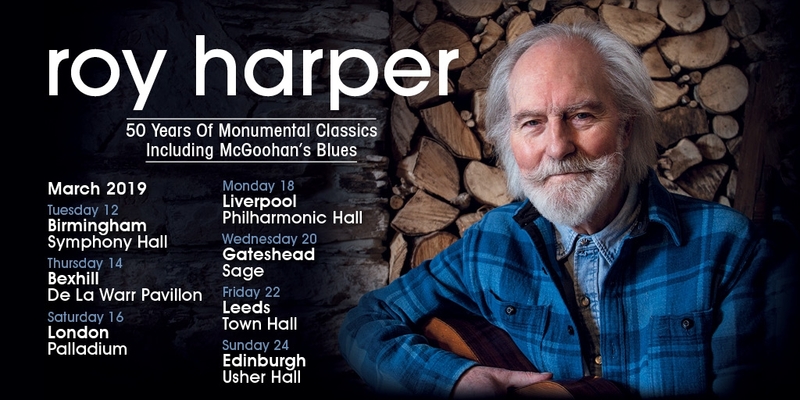 If you're a regular to the Roy Harper website you'll notice a big change. Most notably in the Roy Harper Shop. Besides the new design there are a couple of new features. You can build a wishlist and share it with a friend. We've also enabled the gift option to give it a trial where you can add a gift message and send an order to multiple addresses. One unfortunate thing is that we were unable to import all of the historical customer information so you will have to create a new account with a new password if you wish to open an account. Roy is very pleased to announce the release of his new album, Man And Myth, with Bella Union on September 23rd 2013! 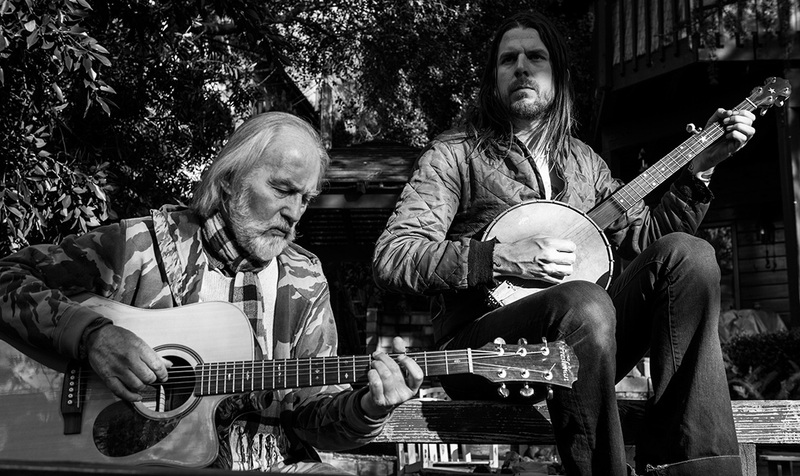 "Bella Union are thrilled and honoured to announce the release of Man And Myth, the new album from Roy Harper, which will be available 23rd September via the label. Man And Myth, Roy's first studio album in 13 years, isn't just proof that one of the leading, most erudite and passionate orators of the British folk rock renaissance hasn't lost an iota of his gifts, but also timely evidence for anyone who has wondered why so many musical luminaries have been lining up to praise this enigmatic and legendary singer-songwriter." Roy performed at the BBC Radio 2 Folk Awards 2013 and picked up the Lifetime Achievement Award. You can see some clips and pics from the night on the BBC Radio 2 website. Roy is confirmed for The End Of The Road Festival August 2012. He's been announced along with the Bella Union artists which has folks asking questions... Roy hasn't actually joined Bella Union at this point but it seems he has been adopted!! Roy signed a deal with Believe Digital and the rollout of the catalogue to digital outlets began in early Autumn. A beautifully packaged 2CD compilation, 'Songs Of Love And Loss', was also released by Union Square Records on their Salvo Label. Two major publicity campaigns running side by side kept us busy! Roy featured heavily in all of the major music magazines and UK broadsheets and on radio and made appearances on prime time television including the BBC Breakfast show and Later with Jools Holland. To end the rush he performed a special show at the Royal Festival Hall in celebration of his 70th, joined on stage by his son Nick Harper, Joanna Newsom and Jimmy Page. It was an amazing show and the response has been extraordinary. A satisfying end to 2011. I've added a list of 2011 media quotes here... and I've updated the Press page with links to features, interviews and reviews. I've linked to online copies when available or to back issues available for purchase. Also... The Magpie Index is showing at Matt's Gallery in London from the 18th of January to the 12th of February. "The Magpie Index is a new single-screen high-definition video art work by artist Richard Grayson, focusing on legendary singer-songwriter Roy Harper and how a fierce personal vision has informed the belief systems of a cultural movement. In The Magpie index Roy Harper delivers a series of monologues to camera. Each section addresses a different aspect of his work, his philosophy and history, covering the counter culture; religion and superstition; ornithology; nature and the environment; political engagement and the end of politics as well as Harper's experiences in the music world and the importance of changing light bulbs." "On Tuesdays, Later… is broadcast live for half and hour. Friday night's extended version offers another chance to see performances from Tuesday's show, along with and additional half hour of music and chat…"
"Due to public demand, choir seats have been made available and can be purchase by phoning 0844 847 9910 (£2.75 transaction fee) or by visiting one of our Southbank Centre Ticket offices in person. Please note these seats are behind the main speakers so the sound may be slightly affected and the view restricted"
With special guest Jonathan Wilson and the odd surprise. ...We are extremely proud to announce the last artist in the six part filmed TV concerts ITV Legends. Roy Harper has a pedigree of no less than 14 live and 21 studio albums and is credited as friend, inspiration and mentor to many of today's great artists. From being guest vocalist to Pink Floyd (Have A Cigar) to the subject of a Led Zeppelin song (Hats Off To Harper), to receiving the MOJO Hero Award from Jimmy Page, Roy’s career has never known a dull moment. His appearances are rare (2 Festival Hall in the last 18 months) Roy will join us to be filmed in front of an audience of just 125 guests on Saturday April 2nd. Champagne and wine reception before gig. Champagne and wine at meet and greet after. DVD with your name on when released (probably May/June) mailed to you. Your name on credit roll of programme..
UK and Ireland - September 2010. Jazz Cafe, London - Saturday June 5th, 2010. The Magpie Index will be shown over the weekend of the 10th and 11th of April 2010 at the Baltic Centre for Contemporary Art, Gateshead, NE8 3BA in the Level 1 Event space. The film will be shown both days at 12.00pm, 2.00pm and 4.00pm. The Magpie Index was previously shown for two months at the De La Warr Pavilion in Bexhill on Sea as part of a five-year retrospective on the work of Richard Grayson. In The Magpie index Roy Harper delivers a series of monologues to camera. Each section addresses a different aspect of his work, his philosophy and history, covering the counter culture; religion and superstition; ornithology; nature and the environment; political engagement and the end of politics as well as Harper's experiences in the music world and the importance of changing light bulbs. The Mapie index is a new commission by Locus+ and the De La Warr Pavilion. Produced by Locus+. Richard Grayson is represented by Matts Gallery London and Yuill/Crowley Gallery Sydney." Roy has been invited by Joanna Newsom to perform as special guest for her two shows at the Royal Festival Hall, in London, on May 11th and 12th. Tickets for this are going to go fast... on sale to Southbank Centre Members on Wednesday 17 February and then to all on Thursday 18 February from 10am. The latest episode of Paul Davison's Roy Harper Podcast is out! Gavin's new album 'Tonnta' is now available in our 'Other Artists' category. Some of you will know Gavin from his opening sets at the 100 Club shows in London and at the 'Debarras' shows here in Clonakilty. There are a few sample tracks to listen to and links for more information. "In The Magpie Index Roy Harper delivers a series of monologues to camera. Each section addresses a different aspect of his work, his philosophy and history, covering the counter culture; religion and superstition; ornithology; nature and the environment; political engagement and the end of politics as well as Harper's experiences in the music world and the importance of changing light bulbs." Opening at the De La Warr Pavilion in Bexhill on Sea 16th January 2010 as part of a five-year retrospective on the work of Richard Grayson. The exhibition continues until 14th March 2010. As part of the Offset creative conference's 'In Conversation' events, Harry Pearce will be on stage in conversation with music legend Roy Harper. Their talk "Flashes From the Archive of Oblivion" will cover their 28 years of friendship and collaboration on many of Harper's records. This will include anecdotal stories behind the records and about the designs themselves. Among Harry's previous work with Roy Harper is his sleeve design for the reissue of The BBC Tapes, sessions for the BBC recorded between 1969 and 1978. The talk will take place on Friday 6th November at Dublin's Offset three-day creative gathering. Posted on the 'Press' pages here. There has been precious little to report in the way of 'Roy' news for the last good while.. but at least he's been having a bit of fun...! Click here to see him star as the cowboy in the short file 'Brokeback Cowboy'. He would like you all to know that he grew his 'Gabby Hayes' beard especially for the part..
Be sides contemplating revitalising his acting career, Roy has been back in the studio working on some new songs. An album release isn't exactly imminent but... he is back at it. Stormcock has been re-mastered and packaged in a 20 page case bound booklet with new pictures prose and poetry. The 6 Vol. BBC Tapes cds are all available again with new artwork. Find more info here. Roy has been invited by Joanna Newsom to perform a 45 minute set before her sold out show at the Royal Albert Hall on September 28th. Joanna has an original style and has had some very good reviews. Unfortunately the show has been sold out for some time now.